The Goodman GPG1348115M41 is a complete packaged gaselectric unit with heating and cooling capabilities. 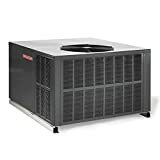 The air conditioning of this model uses a energyefficient scroll compressor and the chlorinefree R410A refrigerant to effectively cool the home. It has a 4 ton and 46,000 BTU cooling capacity.The GPG13M line's gaselectric system uses a 115,000 BTU aluminizedsteel tubular heat exchanger to warm the home. This heat exchanger is crafted from durable, corrosionresistant T140 aluminizedsteel with dualdiameter pipe. This unit runs very silently, as well, due to an insulated cabinet covering an already quiet optimized blower system.Goodman's packaged units are designed to be incredibly energy efficient. This model offers 13.0 SEER and 11.0 EER ratings, as well as an AFUE measurement of 80. These contribute significantly to home heating and cooling costs, especially when compared to systems with less efficient ratings. Plus, with the GPG13M line, the gaselectric system is coated to resist corrosion in addition to its durable louvered cabinet and coil guard, ensuring a long lifetime for this packaged gas/electric unit.The benefit of a packaged unit is that it comes fully complete and selfcontained, housed in a heavygauge galvanizedsteel cabinet with UVresistant powderpaint. This energyefficient model meets California lowNOx emissions standards. It can accommodate a downflow or horizontal installation.